(Nanowerk News) Devices that manipulate very small volumes of fluids are applied in diverse fields, including printer technology, DNA processing and cooling systems for electronics. For some processes involving fluids, such as mixing, it is useful to generate oscillating flows, but this can be difficult for particularly viscous fluids. Now, A*STAR researchers have developed a microfluidic oscillator that produces oscillations even in very viscous fluids ("Analyzing the transition pressure and viscosity limit of a hydroelastic microfluidic oscillator"). Top (left) and side (right) views of the device. Fluid flow causes the diaphragm to undergo elastic oscillations, producing an oscillatory flow at the outlet. 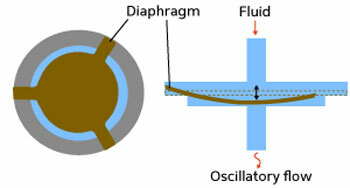 Microfluidic valves and pumps have diaphragms, which are usually made from soft materials, such as rubber, and are operated via external forces. Yet the tiny device, less than 4 millimeters in size, developed by Xia’s team does not need external control. Instead, when the diaphragm is placed in a fluid flow, it responds elastically by wiggling up and down to make the device oscillate automatically (see image). To adapt the design for use with very viscous fluids, the researchers replaced the rubber diaphragm with one made from copper and beryllium foil. While this device has practical benefits, it also raises theoretical implications about the behavior of microfluidic oscillators. The team found that at low fluid pressures, the flow across the diaphragm does not oscillate. Then, above a particular transition pressure, the flow rate drops and oscillatory flow occurs, increasing in frequency as pressure increases. After performing experimental and theoretical tests for different device shapes, fluid viscosities and diaphragm thicknesses, Xia’s team could expand current theories. “Flow-induced vibrations are usually related to flow instabilities and analyzed using a spring–mass model,” explains Xia. The transition from laminar flow to oscillatory flow in their new oscillator was counterintuitive, because increased pressure led to reduced flow rates. The team recognized that this behavior was similar to ‘negative differential resistance’ — a well-established concept that describes certain electric circuits in which an increased voltage leads to a lower current. Xia’s team is currently developing a complete mathematical model of their device using negative resistance and other concepts ‘borrowed’ from electric circuit theory. This should assist them to optimize the device design for practical applications; for example, the enhanced mixing of viscous fluids enabled by the device can intensify and control chemical reactions.